OYSTER BAY, NEW YORK (August 3, 2016) – Mixed conditions tested the patience of the three Oakcliff teams who competed in the 40th Around Long Island Race hosted by Seacliff Yacht Club. The three teams worked patiently and tirelessly through the light breeze to win five trophies awarded. Ethan Johnson and Sean O’Halloran, who double-handed Oakcliff’s Ker 11.3, received three awards for First Place in Division VI, First Place Doublehanded Division, and First Place in Junior Division. Johnson said after racing, “It was an awesome race, a lot quicker then we were expecting. We decided to keep our options open and stick as close as possible to the shore. That decision paid off, especially during the night when we passed most of the fleet.” The team credited their unusual sail choice of having both their windseeker and A2 sails up at the same time. The ‘gybe-set-that-never-was’ allowed them to capture as much wind as possible and sail past the rest of the fleet. Also sailing the event under the Oakcliff banner was Simon Says, an Andrews 68 owned by Lorenzo Vascotto. Out of the 19 crew members, seven were under the age of 25, qualifying them for the youth category as well. It was the first Oakcliff boat to come across the finish line at 6:44 AM, one day and 15 hours after crossing the starting line. Simon Says was also the biggest boat in the fleet, measuring in 10 feet longer then any other boat registered. Coach and bowman Brendan Larrabee was really proud of the crew for working hard together and keeping their patience in the difficult conditions. Many of the crew had never sailed on a boat as big as Simon Says, and many had never sailed together before either. The crew was proud of their results and is looking forward to the next offshore challenge. 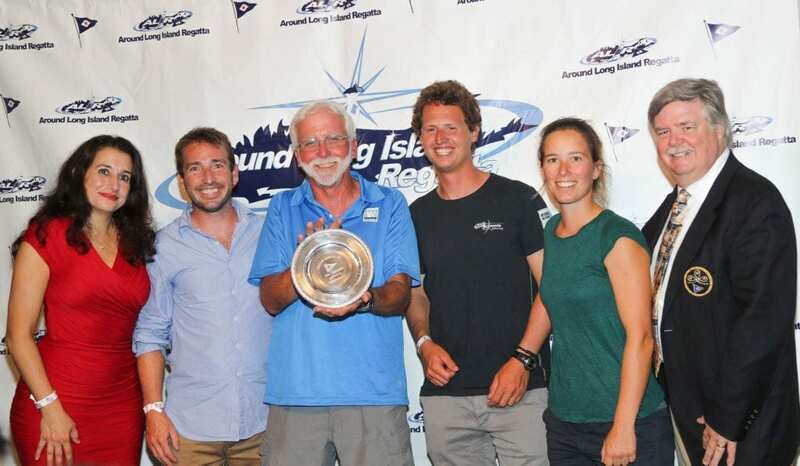 Oakcliff’s Class 40 also raced with four people, finishing third place in PHRF Spinnaker Division IX. The team arriving at the finish line a little over two hours after Simon Says and an hour and a half after the 11.3. Crew member Karine Jansen said, “It was a good race, with a great crew, but unfortunately we got rained on for eight hours. Everyone and everything got wet. Even though conditions were fairly miserable, we still had a lot of fun.” The three teams combined to win the Second Place Team Trophy, with the highly decorated team High Noon beating them for first place. Even though the conditions weren’t ideal for racing, the teams fought to make the best of it. The tough conditions could not dampen the spirits and camaraderie of the competitors, making the event a proud accomplishment for all three Oakcliff teams. Oakcliff Sailing is a non-profit coaching and training center for sailors who have progressed beyond traditional coaching methods. The center can be contacted by email at race@oakcliffsailing.org or by calling (516) 802-0368.